Are you struggling which keywords and tags do you need to optimize on your website? Then these on-page SEO tips would definitely give you a great understanding of on-page optimization. Which tools can be used for on-page SEO? These tools will get you started with on-page SEO. However, there are many SEO tools and SEO techniques that can influence your site ranking in search engines. In my opinion, a well-optimized website with great consistent content can rank even on competitive keywords. It will just take a lot of time and effort from you. If you are not that patient, you can always buy on-page SEO services anytime. 1- Start first with basic SEO strategy – develop a great SEO plan before anything. A well-planned website will automatically do better in search engines rather than a website which has no prior plan. Please check out this article on how to create an effective SEO strategy. 2- Keyword Research – I have written a tutorial on what’s the best way to find valuable keywords using Google Keyword Planner, be sure to check that out. Whichever keyword research tools do you use, always understand your audience outlook on buying a product. If you know your audience well, then I am sure you can find a lot of great keywords using those seed keywords. 4- Develop a site structure – When sites have a great structure, it helps Googlebot to reach and crawl your website and understand its architecture. Also, human visitors also find the site easier to navigate. 5- Write content for your main pages – After developing a website now it’s time to fill those beautiful pages with content that will convert. There are a few things to keep in mind when writing content for your sales pages. 6- Improve your website’s page load speed – Google consider a page load speed especially if it shows your page to mobile users. Mobile users usually looking for a quick answer. Also, Google is pushing mobile users towards using it for quick searches hence they introduced knowledge graph, voice search, etc.. If your page load speed is good, your website will show up more often in searches. 7- Usability testing – This is a part which most beginners forget to add to their SEO strategy. If your website is not usable for the end user, it won’t rank better. Because it will increase your bounce rate and dwell time which is in fact impact ranking. So, no matter how well optimized your website is, if people are bouncing off of it then your ranking will quickly drop then your thoughts. Test your website on different devices and make sure that every link and button is properly working. 8- Set up Google search console – It is a tool for webmasters to identify issues on a website. Problems reported by Google Search Console can be fixed easily. However, the data it offers is highly valuable if you are serious about your website’s SEO and how it is appearing in Google search. You can set up google search console easily by following this article. You can also hire an SEO and give access to your Google Search Console account. Google analytics is a helpful tool to collect data about your audience. You can use this data to better optimize your website and make more content accessible to your users. 10- link building strategy – You have to define which website are relevant to your niche and you can use them to get backlinks from. You can use different tools and practices for it. Check out this article on link building tools. These tools will help you build a great link building strategy for your site. 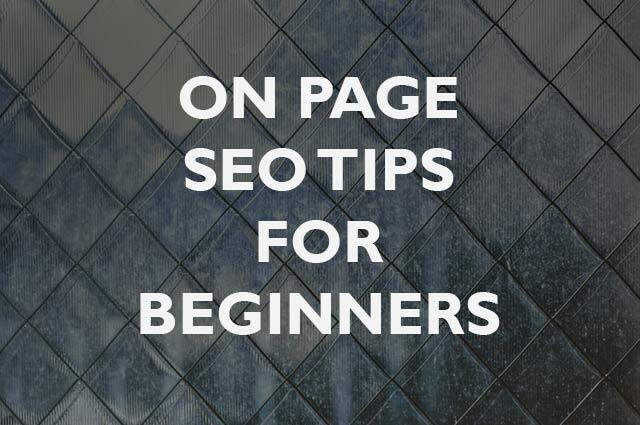 Remember that, on-page SEO should be a crucial part of your SEO strategy. You can rank effortlessly if you follow these on-page SEO tips. I hope you find this article useful. If you did, then I would really appreciate if you share it and let your friends know. Awesome articles on ORM. Can you suggest list of website where I can submit a blog post for strong backlink? Also If you have web 2.0 site list which can come up in Google Alert?